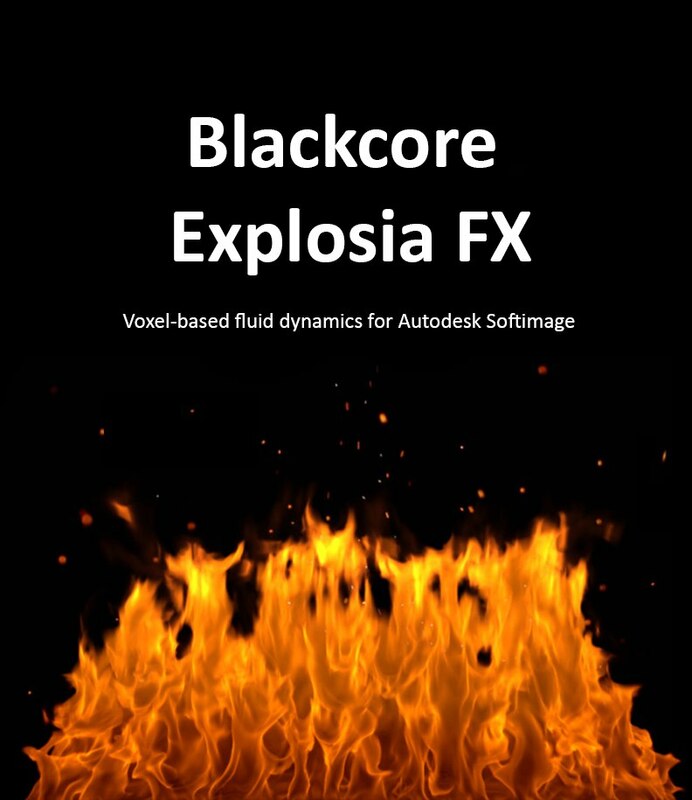 Not to be confused with Oleg's Implosia FX, a mesh scattering simulator— A new gaseous fluids (fire and smoke) simulator from Ukraine based company Blackcore tech. This product features dynamic voxel grids, a CPU accelerated raymarched preview, OpenVDB export, the »render from camera« feature — (see videos) — all build around an ICE node-based workflow. From the product page: ExplosiaFX is a fluid dynamics simulation tool currently integrated in Autodesk Softimage. It is constructed based on a dynamically resizing voxel grid with a modern multigrid solver and thus provides high quality results in reasonable time. Intensive usage of AVX instructions when available makes it extremely fast without any compromises. By supporting the OpenVDB volumetric format, ExplosiaFX removes the need to render simulated data in Softimage, makes easy pipelining possible, as well as external cache processing on the Softimage side. [..] cont'd on the product page (link at bottom). For demo videos, see Oleg's vimeo and the youtube channel. Also, the ExplosiaFX google group was set up. I am glad to present a new Softimage plugin for simulating fluid dynamics - Softimage ExplosiaFX. You can grab a free trial or buy a commercial key. The network floating licensing mode is also possible. Considering the Softimage EOL i should clarify that license for this release will be usable (as free upgrade) with the second wave which i believe will be in Fabric Engine (i am currently investigating a few options and FE looks like a perfect environment for further work). The current build is for Windows only, but i am working on port to Centos linux and any compliant to it. The package includes Arnold shaders as well as Mentalray fallback and these shaders are provided as free (unlimited seats). For more details please visit the product page. Last edited by Mr.Core on 02 Sep 2015, 22:57, edited 1 time in total. Re: Softimage Explosia FX released! This plugin looks amazing. Wish you all the best! Great work man! congratulations on the official release. already tried the demos, super fast sim & render times, real pleasure to use inside of ICE instead of trying to navigate a new unfamiliar app etc. Next job that requires fire or gaseous fluids you have a customer. Well last time I've tried, before year or so, still it was a practically impossible to match Mental Ray, using 3delight's volumes. Wasn't even close, when it comes to speed, quality, memory consumption... Don't believe anything changed to this day. Rendering of millions of points instead of voxels, that might work, but that's probably sufficient for light smokes, nothing else. As an rule of thumb, Renderman + easy an fast volume rendering = kind of oxymoron. Or, looking from flip side - volumes are only aspect of MR, which, very personally, I'm still keeping in good memory. This looks so fantastic and so long overdue for Softimage. Great work!!! Sadly I'm still on Win. Vista. I tried to install the non-avx version but nothing happens at all. I guess I'm out of luck. Is there any chance there would be a way way around this? Edit: just a silly mistake on my part. Now I get the menu but an error regarding a packed volume shader. Cool, and feel free to show us any test material! but this seems encouraging in at least one aspect..
Perhaps would be worth giving it a go and see. Yeah now someone have to use Houdini, Max and 3delight for Max. 1: Obvious advantage of specific technology, or specific design decision. 2: Refinement, coming with something widely, long time used, or with built in renderers. For 1, I'll be interested what RedShift or Octane have to say. Sow some very impressive Octane volume renders. Together with 3d motion blur, full GI, what else not. When it comes to complete Renderman story, my mind stays around REYES, which was great for primary rays over diced geometry, and that's it. Volume render simply doesn't fit nicely, there. Their new ray tracing solutions are new for them, but not new for rest of world. For 2, never sow such level of refinement, like work of mr.Schönberger, or some plugins for Max - despite the all 'love' to bad old MR, or, antique Max's defaut scanline renderer. When it comes to Renderman compliant, there's little problem, once they were jumped into ray tracing field, complete book of rules and habits had to be written again - but it wasn't, imho. Back to topic, I think it's better for plugin, to do a proper job with smaller number of renderers, instead of wasting a time to support everything around. Yet I know that Since pathtracing was introduced 2013(? ), did it quickly become the default method. But BTW, would you know it there are trade-offs with path tracing for some of it's traditional benefits? And perhaps as you say did volumes improve in the same go? thank you so much for this wonderful plugin! it seems to be very powerful!